The system studied in this example, as shown in fig. 9.20, is a sinusoidal voltage source rectified into an R-L load through a silicon controlled rectifier. In this example, the SCR is modeled by the series combination of the simple switch S1 and the piecewise-linear resistor !R2, as shown in fig 9.21. 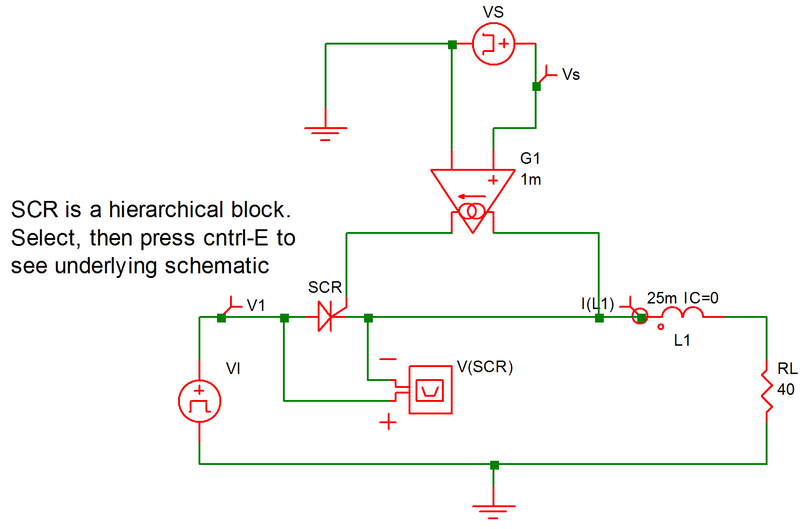 The input file for this circuit is shown in fig 9.22. The comparator U2 (!D$U2 in the input file), the SR Flip Flop U1 (!D$U1 in the input file), and the elements E1, H1, and V5 together form a network that models the switching of the SCR. When a sufficient gate current is applied between the gate and the cathode, causing the voltage across the non-inverting input of U2 to exceed 2.5 V, the output of U2 will rise to approximately 5 V, thus setting the SR Flip Flop, which in turn causes the switch S1 to be closed. When S1 is closed, the model characteristic from anode to cathode is the series combination of a small resistance of the switch and a diode. On the other hand, if the SR flip flop is reset, the switch S1 will be opened, and the model characteristic from anode to cathode looks like a large resistor in series with a diode. 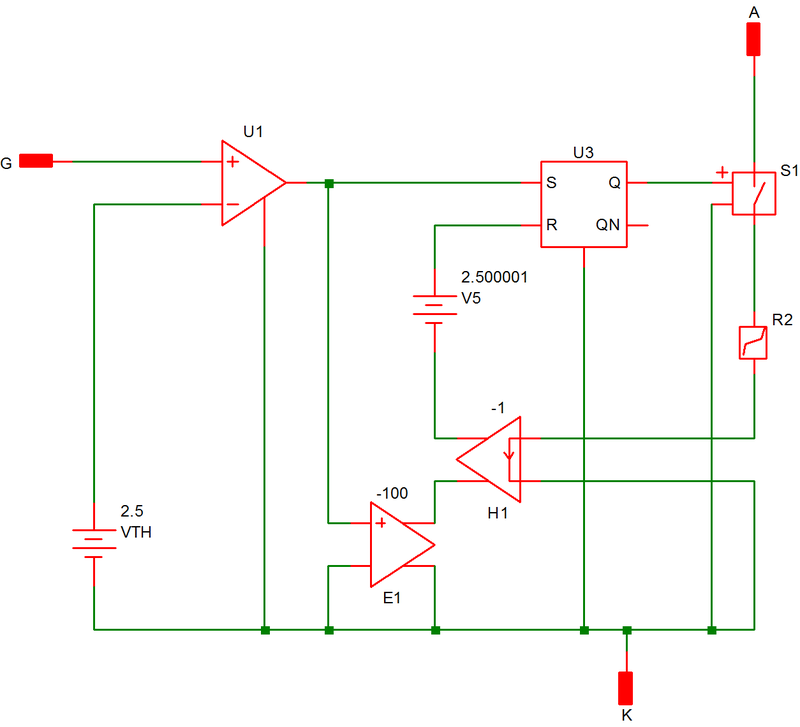 The flip flop is reset when the voltage across its reset input, which is equal to the sum of the voltages across E1, H1, and V5, exceeds 2.500001 V. This situation occurs when the gate signal is absent and the current through the SCR is negative. The presence of E1 makes sure that the reset input does not reach its threshold value of 2.500001 V whenever there is a gate signal present. E1 accomplishes this by having its output equal to 500 V whenever the output of U2 reaches 5 V.
The variables of interest are the input voltage V(VI), the signal voltage V(VS), the current I(L1) through the inductor, and the voltage V(SCR) across the SCR. A differential voltage probe has been added to plot the latter. 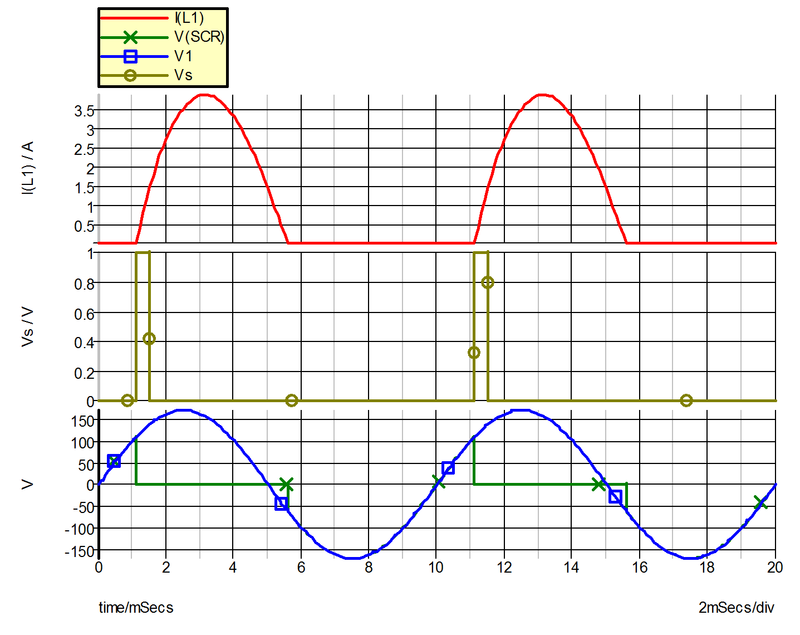 The waveforms associated with these variables as obtained from the simulation are shown in fig. 9.23. 9.20 Example 7: A silicon-controlled rectifier with series R-L load.